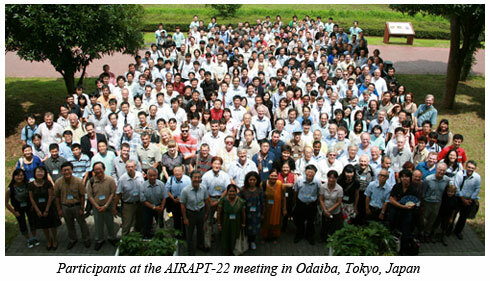 At the recent AIRAPT-22 meeting, held in Odaiba, Tokyo, Japan from July 26 to July 31, CDAC was well represented, with 26 presentations made by CDAC-affilliated scientists from across the different sectors of the Center. CDAC Academic and National Laboratory partners, CDAC students, GL staff, HPCAT and HPSynC staff, and CDAC collaborators participated in 48 different technical sessions, which were highlighted by a plenary session during which Geophysical Laboratory and CDAC director Russell Hemley received the P.W. Bridgman Award. 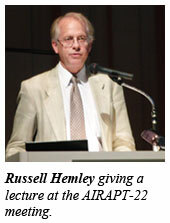 At the plenary session, Hemley delivered a lecture entitled, "Percy W. Bridgman's Second Century." Other CDAC-affiliated participants included Ronald E. Cohen (Carnegie), Alexander Goncharov (Carnegie), Malcolm Guthrie (APS, HPSynC), Zhenxian Liu (Carnegie, NSLS), Ho-kwang Mao (Carnegie), Yue Meng (Carnegie, HPCAT), Subramanian Natarajan (Carnegie), James Schilling (Washington University, St. Louis), Tim Strobel (Carnegie), Wenge Yang (Carnegie, HPCAT), and Shibing Wang (Stanford).